Tequila is the champagne of Mexico. Seriously, Mexican law actually states that no liquor can be labelled tequila unless it comes from the western state of Jalisco (or select districts of other Mexican states). And, like sparkling wines, tequilas come in all varieties and price ranges. With the help of the connoisseurs at FindTheBest, we compiled a list of the world’s top tequilas. They ranked the brands based on reviews from the San Francisco World Spirits Competition, the International Wine and Spirit Competition, Wine Magazine Enthusiast, the Beverage Testing Institute, and Tequila.net. So get your shot glass out and get ready for a toast. With El Ultimo Agave Tequila Añejo you can get the full añejo – “aged” – tequila experience: it’s aged 12 months to create a more complex flavour. But it only costs $US1.30 per shot ($US22 per bottle) – about 45 per cent cheaper than the average tequila. This golden brown añejo, aged 24 months in a white oak casket, smells of spice and vanilla but tastes of sweet agave and caramel. It won Double Gold this year at the San Francisco World Spirits Competition. The El Mirage, Arizona, family behind 3 Amigos grows and distills their own blue Weber agave in Mexico before importing it to the U.S. for sale. Silvery-coloured El Grado Blanco is hand bottled directly after distillation. Minty and fruity aromas complement the strong Agave taste. Manufacturers El Grado select each agave plant, grown Los Altos, Jalisco, at peak maturity to maximise the sugary agave flavour. This plata is one of the pricier tequilas on our list, but one or two shots might get you where you want to go – its alcohol content is 50 per cent. A long minty finish will leave your mouth feeling soft and warm. Corrido harvest their blue agave plants in the volcanic soil of Jalisco’s highlands. The plants are high in sugar content, which adds a floral nature to their sweet tequila. In traditional fashion, the agave is slow-cooked and twice distilled in copper pots. Definitely a good choice if you like your tequila clear and fruity. Manana Añejo will warm you up on a cold day. At first sip, it tastes fruity and oaky. That’s followed by a dry, full body and a long warm finish. No wonder it was a Double Gold winner at the 2012 San Francisco World Spirits Competition. Experts describe this golden añejo as soft and silky, with notes of crème brûlée and caramelized nuts. It’s aged 18 months in an American Oak barrel. Try it with a good cigar. Twenty-four months in an American Oak casket lends this añejo its deep amber colour. It has a clear bright taste and a fruity and nutty finish. And it comes from the highlands of Jalisco, one of the best places in the world for growing agave. The Herencia Blanco appears transparent but its taste is more than apparent: herbal with strong citrus notes. Experts describe this blanco as round and satiny with a smooth full body. The Marquez de Valencia is a reposado – “rested” – tequila, aged 10 months in a white oak cask. The straw-coloured drink smells of wood and berries and tastes like the perfect dessert: caramel, vanilla, and a chocolatey aftertaste. Production is limited, so grab a bottle if you ever come across it. Aged 9 months in French and American Oak, the Reposado is the newest addition to Riazul’s portfolio. Its flavour is complex – a mixture of oak, citrus, fruit, and chocolate. 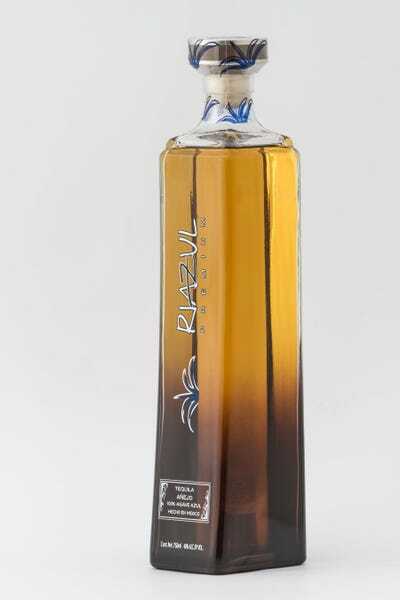 If you like Riazul’s reposado, you’ll probably like their better-known blanco, the Premium Silver. Extracted by a shredder and twice distilled in stainless steel, the blanco has an earthy aroma. Its minty agave leaves your mouth warm with a mild chocolate aftertaste. The Trago Silver is only 33 per cent alcohol and has a thin mouth feel and a clean, sweet taste. It’s the perfect base for your mojito or margarita. And it’s a three-time San Francisco World Spirits Competition winner. This is a small-batch, traditionally crafted tequila, made by renowned distillers Leopoldo Solis Tinoco and Gabriel Espindola Martinez. Soft, silky scents of vanilla, dried fruit, and pepper give way to a long, warm, spicey finish. Twice distilled in copper, the Gran Dovejo is then aged 9 months in oak barrels, leaving it a bright golden hue. This honey-flavored añejo with hints of vanilla, fruit, and spices is aged for 24 months – longer than any other in its class, according to Riazul. Their French oak barrels are made from wood found in Burgundy’s Citeaux forests. Its coppery-golden-hued body has an aroma of caramel and almond. At first sip it is sweet, followed by a buttery, cinnamon finish. Riazul’s reposado and blanco made our list, but the añejo is the cream of the tequila crop.